The Amon California King Bed is crated in beautiful Ash Burl or in Palm Walnut with. Photos shown feature the Ash Burl. The headboard and platform is upholstered in UltraSuede, which can be ordered in several colors. Cantilever nightstands are beautifully shaped into a subtle elliptical oval, adding additional flow and intrigue to the beauty of the design. All wood surfaces are finished in a flat sheen polyester for protection as well as allow the beauty of the grain to reach maximum visual depth and character. Hand crafted one piece at a time by artisans in Spain. For a discerning taste of those seeking heirloom quality home furnishings, this is truly a pinnacle design. A person just doesn't ever get tired of looking at a piece as beautiful as this. The Amon King Bed is crated in beautiful Ash Burl or in Palm Walnut with. Photos shown feature the Ash Burl. The headboard and platform is upholstered in UltraSuede, which can be ordered in several colors. Cantilever nightstands are beautifully shaped into a subtle elliptical oval, adding additional flow and intrigue to the beauty of the design. All wood surfaces are finished in a flat sheen polyester for protection as well as allow the beauty of the grain to reach maximum visual depth and character. Hand crafted one piece at a time by artisans in Spain. For a discerning taste of those seeking heirloom quality home furnishings, this is truly a pinnacle design. A person just doesn't ever get tired of looking at a piece as beautiful as this. The Amon Queen Bed is crated in beautiful Ash Burl or in Palm Walnut with. Photos shown feature the Ash Burl. The headboard and platform is upholstered in UltraSuede, which can be ordered in several colors. Cantilever nightstands are beautifully shaped into a subtle elliptical oval, adding additional flow and intrigue to the beauty of the design. All wood surfaces are finished in a flat sheen polyester for protection as well as allow the beauty of the grain to reach maximum visual depth and character. Hand crafted one piece at a time by artisans in Spain. For a discerning taste of those seeking heirloom quality home furnishings, this is truly a pinnacle design. A person just doesn't ever get tired of looking at a piece as beautiful as this. 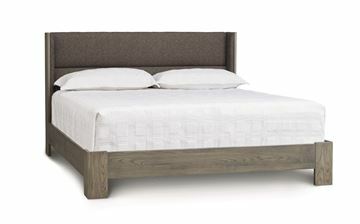 The Sloane King Platform Bed with legs by Copeland Furniture, crafted in solid Ash Wood. This design does not need a box spring to support your mattress. Ash is a North American wood, and has a beautiful pronounced grain. 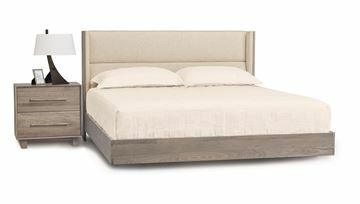 The Sloane design really shows off the wood grain with the generous side rails, foot rail, and the outside vertical structure of the headboard. There are several different materials to choose from for the upholstered inset of the headboard. And the ash wood can be finished in five different stains. Please see more details below. 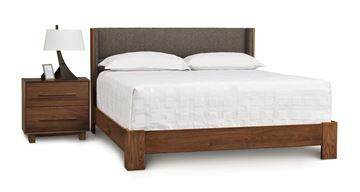 The Sloane Queen Bed with legs by Copeland Furniture, crafted in Walnut. This design requires a box spring to support your mattress. Walnut is a North American hardwood, and has a beautiful deep wavy grain pattern. The Sloane design really shows off the wood grain with the generous side rails, foot rail, and the outside vertical structure of the headboard. There are several different materials to choose from for the upholstered inset of the headboard. Please see more details below. The Sloane King Bed with legs by Copeland Furniture, crafted in Walnut. This design requires a box spring to support your mattress. Walnut is a North American hardwood, and has a beautiful deep wavy grain pattern. The Sloane design really shows off the wood grain with the generous side rails, foot rail, and the outside vertical structure of the headboard. There are several different materials to choose from for the upholstered inset of the headboard. Please see more details below. The Sloane Walnut Queen Platform Bed by Copeland Furniture, crafted in beautiful walnut, this design requires a mattress only, no need for a box spring. The Sloane design really shows off the wood grain thanks to the generous side rails, foot rail, and the outside vertical structure of the headboard. There are several different materials to choose from for the upholstered inset of the headboard. 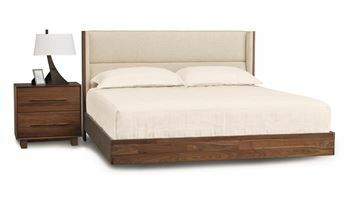 The Sloane Walnut King Platform Bed by Copeland Furniture. Crafted in beautiful walnut, this design does not require a box spring to support your mattress. The Sloane design really shows off the wood grain thanks to the generous side rails, foot rail, and the outside vertical structure of the headboard. There are several different materials to choose from for the upholstered inset of the headboard. The Sloane King Bed with legs by Copeland Furniture, crafted in solid Ash Wood. This design requires a box spring to support your mattress. Ash is a North American wood, and has a beautiful pronounced grain. The Sloane design really shows off the wood grain with the generous side rails, foot rail, and the outside vertical structure of the headboard. There are several different materials to choose from for the upholstered inset of the headboard. And the ash wood can be finished in five different stains. Please see more details below. The Chiara King Bed by W. Schillig. Fully upholstered all the way around, so feel free to show it off in a room! Crafted utilizing hard wood framing and 100% genuine top grain leather throughout. Optional slat kit, if selected, creates a sleek low profile look to the bed, and replaces a traditional box spring. If you have an adjustable bed base or want to use your own box spring, then do not add the slat kit. The leather side rails are 18" tall. The Chiara is available in many different leathers and with three different leg styles. 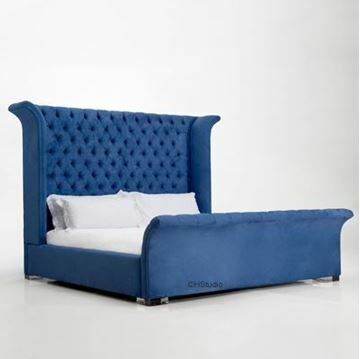 The Chiara Queen Bed by W. Schillig. Fully upholstered all the way around, so feel free to show it off in a room! Crafted utilizing hard wood framing and 100% genuine top grain leather throughout. Optional slat kit, if selected, creates a sleek low profile look to the bed, and replaces a traditional box spring. If you have an adjustable bed base or want to use your own box spring, then do not add the slat kit. The leather side rails are 18" tall. The Chiara is available in many different leathers and with three different leg styles. Beautiful natural walnut, pumice gray textured fabric, and matte black legs combine to make the stunning Andes Bedroom Collection made by Star International Furniture. Comes standard with a substantially sturdy wood slat system, so no box spring is required for this platform bed. The Moon Bed by H. Studio. Feel like you're sleeping under stars by the graceful and dramatically shaped headboard. The entire bed is hand crafted by the artisans of H. Studio. The sturdy hardwood frame construction is a demonstration of uncompromising quality. The tufting is available in standard form, or for added detail you can opt for Swaroviski Crystals inlaid in each tuft. The bed rests upon beautiful clear acrylic legs, and is available inn a variety of Passion Suede colors. The Mirage Bed by H. Studio. A dramatic low profile fully upholstered bed, a beautiful interpretation of a graceful desert mirage. Available in a wide range of Passion Suede and Ultrasuede HP Covers. Crafted according to H. Studio's uncompromising attention to quality and detail, each square panel tuft is done by hand, and the entire frame is crafted in solid hard wood. Made in Queen, King, and California King Bed Sizes. The Galaxus Bed by H. Studio. The Galaxus Bed is pure luxury. With a high arched back and sophisticated tufting, it makes a bold and romantic statement. Available in a wide range of Passion Suede Covers. Crafted according to H. Studio's uncompromising attention to quality and detail, each tuft is done by hand, and the entire frame is crafted in solid hard wood. The look is finished using clear acrylic legs. Made in Queen, King, and California King Bed Sizes. The Albany Queen Bed by H. Studio is absolute simplicity and symmetry. Crafted with a solid hardwood frame, a comfortably padded headboard, and subtle clear acrylic legs. Available in a variety of beautiful Passion Suede covers. King size bed adds 16" to the width. The Sasha California King Bed by H. Studio. The Sasha features a tall headboard with gently curved wings and elegant tufting for an added touch of romanticism. The headboard features dramatic hand tufting designed to compliment Swarovski crystal accents. You can select from a wide variety of passion suede colors for the bed to be upholstered in. Legs are available in acrylic, wood, or steel. The Sasha King Bed by H. Studio. The Sasha features a tall headboard with gently curved wings and elegant tufting for an added touch of romanticism. 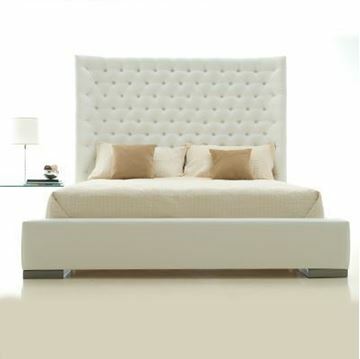 The headboard features dramatic hand tufting designed to compliment Swarovski crystal accents. You can select from a wide variety of passion suede colors for the bed to be upholstered in. Legs are available in acrylic, wood, or steel. The Imperia Bed by ALF Italia. The design is timeless and pure contemporary in style. Crafted in high gloss and polished white lacquer, and accented with polished chrome reveals. The headboard features a leather panel that is surrounded by hidden LED lights. Nightstands feature soft closing drawer glides. The Sloane Bed with legs by Copeland Furniture. The Sloane is available as a King Bed or Queen Bed. This design requires a box spring to support your mattress. The bed is crafted in beautiful Ash Wood. Ash is a North American wood, and has a beautiful pronounced grain. The Sloane design really shows off the wood grain with the generous side rails, foot rail, and the outside vertical structure of the headboard. There are several different materials to choose from for the upholstered inset of the headboard. And the ash wood can be finished in five different stains. Please see more details below. 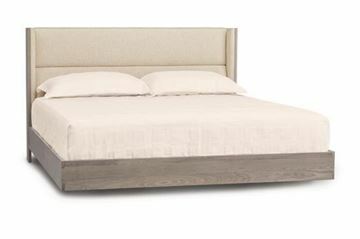 The Sloane Queen Platform Bed by Copeland Furniture, crafted in beautiful Ash Wood. Ash is a North American wood, and has a beautiful pronounced grain. The Sloane design really shows off the wood grain with the generous side rails, foot rail, and the outside vertical structure of the headboard. There are several different materials to choose from for the upholstered inset of the headboard. And the wood ash wood can be finished in five different stains. This design only requires a mattress; you do not need a box spring. 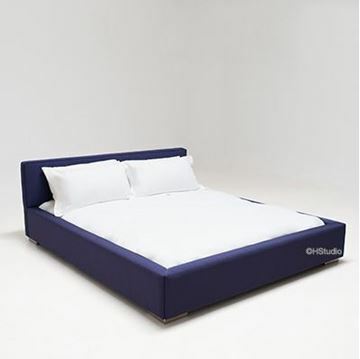 The H. Studio Liberty Queen Bed. A stately design, with a beautiful tall headboard, and gracefully curved foot board. Tufting on the inside panels of the headboard and foot board add a unique classic look to this stunning bed. The bed rests upon clear acrylic legs. A box spring is required for this bed. The Liberty Bed is available in a wide variety of Passion Suede and other H. Studio covers. Please see below for more information. The H. Studio Liberty King Bed. A stately design, with a beautiful tall headboard, and gracefully curved foot board. Tufting on the inside panels of the headboard and foot board add a unique classic look to this stunning bed. The bed rests upon clear acrylic legs. A box spring is required for this bed. The Liberty Bed is available in a wide variety of Passion Suede colors. Please see below for more information. The Sasha Bed Queen Bed by H. Studio. The Sasha features a tall headboard with gently curved wings and elegant tufting for an added touch of romanticism. The headboard features hand tufting designed to compliment Swarovski crystal accents. You can select from a wide variety of passion suede colors for the bed to be upholstered in. Legs are available in acrylic, wood, or steel.